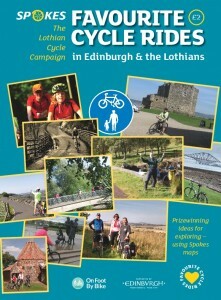 The Spokes Favourite Cycle Rides booklet describes eight of the best entries in our 2015 ‘My Favourite Bike Ride’ competition. Competition winners were chosen not just on the basis of the routes, but also on why they were so special to the person. The rides in the booklet were selected from the best entries so as to give a variety of areas, distances and types of ride. Most of the rides (and their names) were amended somewhat from the original entries, to make them as helpful as possible for somebody new to them. Please note that the rides in the booklet are not fully detailed and your exact route should be decided in conjunction with a map – the booklet indicates which of the Spokes maps are needed for each ride. For other rides, unaccompanied or accompanied, see our rides page. This page gives the original competition entry for each of the 8 rides in the booklet. Fu rther information for some of the rides may also be added.